Mix together the chilli powder, sugar and vinegar. Stir in the green onion well so they are coated. Marinate the chicken for at least 6 hours in the soya sauce, garlic and pepper, stirring occasionally. Heat your barbecue to medium and place your chicken skin side down if using chicken with the skin on. Depending on the thickness of the chicken cook for 5 - 7 minutes then flip and place cheese slices on top. Cook for another 4 - 5 minutes until cooked through. Remove from grill and serve with buns and all the toppings. * These days some chicken breasts are a little too large for a burger and I slice them in half horizontally. If so, do that before marinating allowing more flavour to sink in. I throw all the sauce ingredients into a pyrex measuring cup and microwave it for 40 sec. You could do it stovetop as well. With the leftover sauce, you can toss it with roasted cauliflower or with some leftover chicken. Begin by heating a fry pan over medium heat and adding the olive oil. When hot add the sliced chicken breast. Spread it out in the pan so every piece makes contact with the pan. Let cook for 4 - 5 minutes, when you see a little colour then flip and cook the other side. Let cook for 3-4 minutes on the other side. Add the Frank's red hot sauce (1 tbsp) and toss. Remove from the heat and set aside. Try not to overcook the chicken because it will cook again on the pizza. Mix the buffalo sauce and tomato paste together. Spread the sauce over the crust evenly. Layer the chicken, then the peppers and onions. Spread the mozzarella over the pizza. Crumble the blue cheese over the top. Bake for 25 minutes. Heat the coriander and cumin seeds in a dry pan over medium heat. Move around and after a few minutes of toasting, you should be able to smell them. Remove them from the heat and add to the mortar and pestle. Smash well. Add the lemongrass and ginger and smash again. Add the rest of the marinade ingredients minus the coconut cream. When smashed into a paste like consistency, remove from the mortar and mix with the coconut milk. Cover the chicken with the marinade making sure to cover all of the chicken. Marinate for a few hours in the fridge. Make sure to soak your sticks in water so they don't burn when cooked on the barbecue. First, if you have raw peanuts, you must toast them over a medium heat until they are brown. Then place them into a small food processor and whaz them well. Some will be powdery and some will be in bits. Heat the coconut oil in a sauce pan over medium heat. When hot, add the curry paste. Cook for a few minutes making sure to stir it about so it doesn't burn. After a few minutes, add the peanuts and mix well. Heat the peanuts for a few minutes and then add the rest of the ingredients. I initially just add the cream from the can of coconut milk. After mixing it well and letting it cook for about 5 minutes, turn the heat to low and add the coconut liquid found at the bottom of the can. Let cook another 3 - 4 minutes and taste test. Add more salt or sugar to adjust to your tastes. This can be set aside and heated up just before serving. ​Begin by cooking the lasagna noodles in plenty of salted water. Cook so they are very al dente as they will continue to cook when they are baked. Heat a saucepan over medium heat and melt the butter. When melted add the rosemary, and thyme. Stir for a minute and then add the flour and cook for another minute. Using a whisk, very slowly add the milk and continue to whisk until half the milk is gone. Allow the mixture to come to a simmer and it should start to thicken. Continue to whisk while adding another half a cup of milk. When it begins to thicken again add your cream cheese but add in little blobs so it melts easily. After incorporating all the cream cheese, turn the heat down and add the chicken, lemon zest and salt and pepper. If more milk is needed then add now. You want this sauce to be able to spread easily over a layer so, not too thick or too thin. ​In a 9x11 casserole dish, begin layering your lasagna by first adding a very thin layer of sauce on the bottom then 4 noodles. Add another layer of sauce then half your asparagus lined up. On top of the asparagus sprinkle some mozza and then some parmesan. Then you need another layer of noodles, repeat. After this layer add the noodles, spread what sauce you have left and generously cover with cheese. This turkey can make 4 servings or one Tasty Thai Pizza and one breakfast bowl. ​Begin by heating a frypan over medium heat. When hot, add the onion and garlic and saute for a few minutes. Add the ground turkey and break it into small pieces. Cook until the turkey is just done and add the paste and salt. Mix well and cook for another few minutes. This is enough turkey for 4 servings. The amount of spinach and peppers in the recipe above is for one serving so if you are making more than one serving, increase the amount of peppers and spinach accordingly. Add the spinach and peppers to the turkey mixture and saute for a few minutes until the spiach is partially wilted. Push all the ingredients to the side of your frypan and add a bit of oil to the empty side. Crack the egg into the hot oil and fry. Flip when done on one side (just a few minutes) and cook to your liking. Runny yolk is best. Place meat mixture on a plate or bowl, top with the egg then basil. *kaffir lime leaves can be bought at Asian stores and can be cleaned, dried and frozen so you can grab one whenever. If you don't have any, you could also use lemongrass or the peel of a lime. 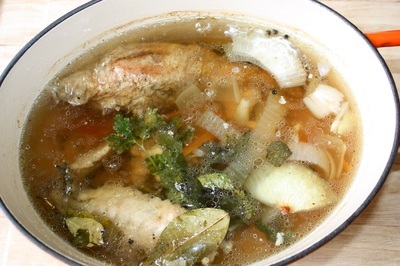 In a large soup pot or dutch oven, place all the above ingredients and cover with water. This is going to simmer for ~3 hours so make sure you have a good amount of water. Use a low heat to simmer checking every once in a while to skim off any foam that may come to the top. When finished simmering, remove the bones or leg and wing from the pot and let cool. Strain the broth into another pot or large bowl. Clean all meat off the leg and wing and add back to the broth if you plan on making turkey soup or stew. You can freeze them or use them separately if you choose. Mix all ingredients together in a large bowl. Roll into balls, I usually make ones a bit smaller than golf balls. Using a cookie scoop makes this go much faster. Place balls on a cookie sheet that is lined with parchment paper. Cook for 20 min at 350. If you are going to freeze, lay on parchment paper on a cookie sheet so they are not touching, cover and put in the freezer. When frozen, transfer to a container or ziploc. I make a simple green curry to go with these. Heat up a sauté pan with a little veg oil. Saute whatever veggies you choose to put in (everything is good), when veggies are half way done add 1 to 2 tbsp of green curry paste, depending on how hot you like it. 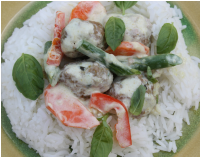 Add balls as well and saute for 3 or 4 min. Add the thick coconut cream on the top of your can and leave the liquid at the bottom in case you need to thin it out. If there is no noticeable cream, add 1/2 the can and add slowly as needed for a creamy consistency. Stir to incorporate everything. Add about a tsp of fish sauce and a tsp of brown sugar. Let simmer for about 5 minutes. Taste test. If not salty enough, add more fish sauce, if too spicy, add a little more brown sugar and/or coconut milk. Serve with rice. Mix all of the above ingredients and divide into 4 burgers. I often chill the burgers for at least a half an hour before barbecuing as they tend to stay together better. Barbecue or fry over medium heat, flipping after about 7 minutes. Cook for another 4 - 5 minutes until done. Put all ingredients into a blender or food processor. Whaz for a few minutes, I left mine with a little texture but it is up to you. We ate our burgers on toasted buns with spread smeared on them, tomato slices and lettuce. Yummo! Combine the bouillon, chili sauce, honey, oil, shallots, vinegar and lime leaves and whisk together to form a uniform paste. Reserve some paste for brushing, and place the rest in a resealable plastic bag. Toss the chicken wings in the paste in the bag and allow to marinate for 30 minutes to 1 hour. Build a hot charcoal fire on one side of the grill. Set the chicken wings on the grill opposite of the hot coal side. Cover the grill and cook until the wings are just about cooked through, 25 to 30 minutes. Rotate the wings halfway through for even cooking. To finish the wings, brush with reserved paste and grill directly over hot coals until charred slightly. **I have made these wings on both the barbeque (propane not charcoal) and in the oven. Weirdly, both my husband and I agreed we liked them in the oven better, go figure! So I bake them in the oven for 25 minutes and then take them out, brush them with the marinade I set aside then put them on broil for 3 - 5 minutes. Mix everything together and form into meatballs. I marinated them in Adam Gartler's sauce (above) and then baked on a cookie sheet lined with parchment paper for 20 minutes at 350. Then I brushed them with some marinade that I had set aside and broiled them for about 3 minutes. 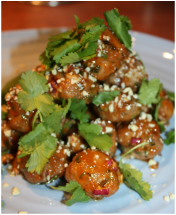 I topped the turkeyballs with peanuts and cilantro. some stalks of fresh herbs (thyme, rosemary, sage , oregano, parsley,) use whatever combination you have. In a large soup pot or dutch oven, place all the above ingredients and cover with water. This is going to simmer for ~3 hours so make sure you have a good amount of water. Use a low heat to simmer checking every once in a while to skim off any foam that may come to the top. When finished simmering, remove the leg and wing from the pot and let cool. Strain the broth into another pot or large bowl. Clean all meat off the leg and wing and add back to the broth if you plan on making turkey soup or stew. You can freeze them or use them separately if you choose. **You can use the carcass of the turkey or a chicken to make this as well and I always do. 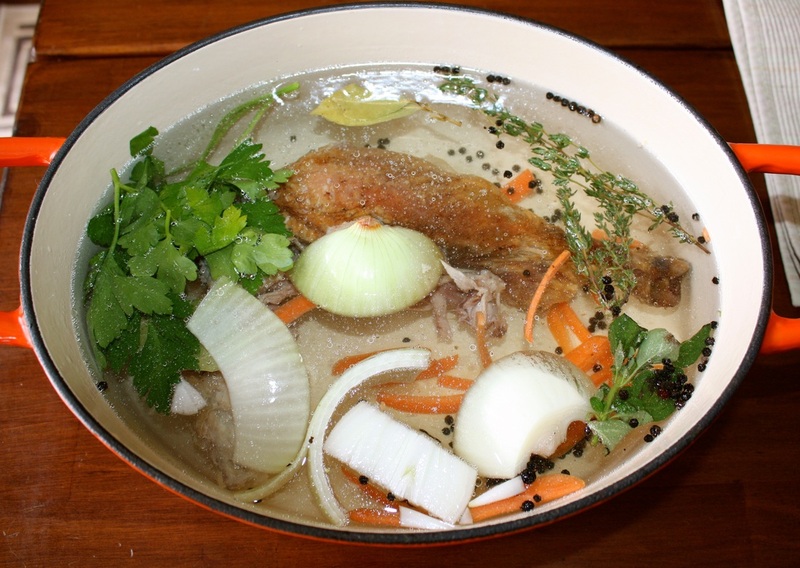 I never throw out the bones of poultry without making a broth with them first. After a big turkey dinner I always bag a leg, wing and another bone or two together, then the carcass separately making 3 bags and freeze them all. There is enough meat from these pieces to make a large pot of soup.